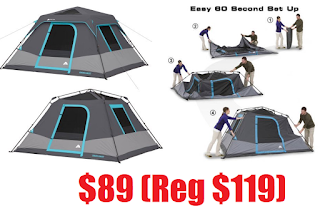 Ozark Trail 6-Person Dark Rest Instant Cabin Tent $89 (Reg $119) + Free Shipping. Sets up in just 60 seconds! This 10 x 9 feet instant tent requires no assembly because the poles are pre-attached to the tent, just unfold and extend. Now you can spend less time setting up your tent and more time killing mosquitoes and running for your life from bears.